YouTuber Jimmy 'Mr. Beast' Donaldson teamed up with 36 other content creators to host a real-life battle royale tournament. The event was set up to celebrate the release of Apex Legends and was sponsored by Respawn. It saw Donaldson compete against the likes of Preston, Lachlan, Muselk, Typical Gamer and Caspar Lee; who together amass over incredible 1 billion views per month with their channels. 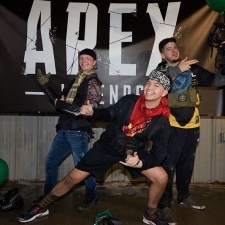 The event was an invite-only competition and hosted in Hollywood Sports Park in Los Angeles, a popular paintball and airsoft park. The prize for winning the tournament was $200,000. Within 12 hours, the YouTube video documenting the event was viewed over 7 million times. The video is available on Mr. Beast’s official YouTube channel and has racked up over 15 million views to date. “As a YouTuber, I’ve talked with so many great creators on the platform but getting together in person is challenging due to our dispersed locations," Donaldson said. "This is how the Battle Royale idea started–a brainstorming session on a way to interact in person with some of the platform’s greats. Additionally, my subscribers receive an awesome video, thus allowing them to be part of the experience also. Viral Visionaries: What kind of impact will Fortnite have on YouTube Gaming? Fortnite versus Playerunknown's Battlegrounds: Which battle royale game is racking up the most views online?